It’s a very simple lunch due to the time crunch. 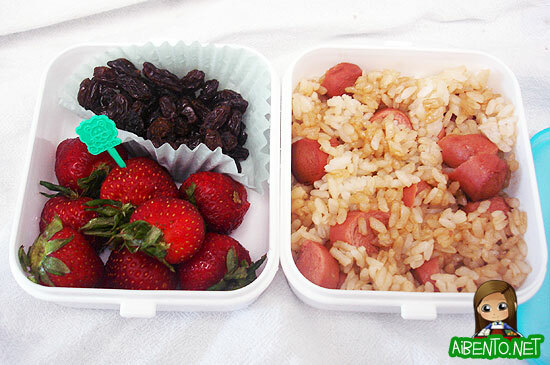 I’d made them shoyu vienna sausage (a favorite of the kiddos) with rice and so I cut it up and mixed it with rice for one half then added some more of the mini strawberries (sliced while still whole) and some raisins. It’s a lot plainer looking than I would have liked, but I really didn’t know I’d be making a lunch bento for him to eat at 2:30 pm! I’ve decided to put all my bento pics on my new Flickr account so that I can use the tags to sort them. My domain came back up finally and lots of pictures were missing, so I had to re-upload some of the ones I hadn’t changed over. They should all be displaying properly now.